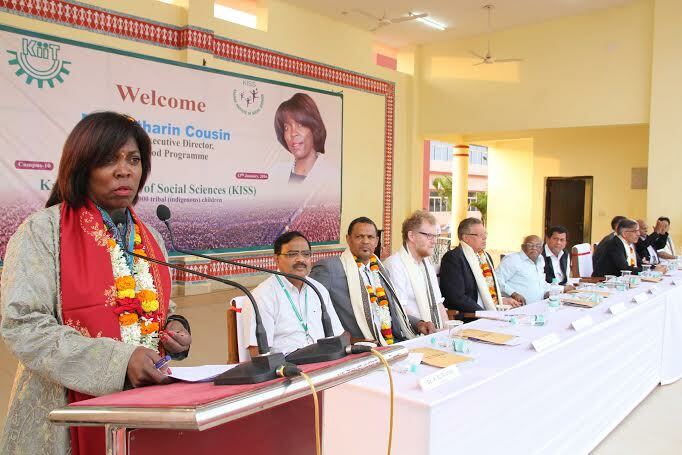 Her Excellency Ms. Ertharin Cousin, Executive Director, World Food Programme visited Kalinga Institute of Social Sciences (KISS) and Kalinga Institute of Industrial Technology (KIIT) on January 13, 2016 in Bhubaneswar. Dr. Achyuta Samanta, Founder, KIIT & KISS had requested her to visit the institution six months back. Her visit was in response to the invitation. She went around various departments and units of KISS and interacted with 25,000 tribal students. “You are the future of India as well as the world. Dr. Samanta has given you a tremendous platform to dream. KISS is the right platform to fulfill your dreams”, she told the students. “We can achieve hunger-free, poverty free, peaceful and prosperous world with your support. You can achieve a hunger free and poverty free India by fulfilling your dreams. Peace can be achieved all over the world if we can make it poverty free and hunger free”, Ms. Cousin said. Expressing satisfaction over the success of students of KISS in various fields, she told them that they are now the member of UN family. Among others, important dignitaries including Mr. Manoj Juneja, Assistant Executive Director, WFP; Mr. David Kaatrud, Regional Director for Asia; Dr. Hameed Nuru, Representative & Country Director, WFP India; and Mr. Jan Delbaere, Deputy Country Director accompanied Ms. Cousin. Renowned social worker Padmashree Jokin Arputham; Dr. David Satterthwaite, Nobel Peace Prize, 2007, IPCC Team, Senior Fellow, International Institute for Environment and Development; and Prof. Dave Harris, Dean, Herberger Business School, St. Cloud State University, USA also visited KISS.